Merry Christmas Eve!! I’m so excited that Christmas is FINALLY (almost) here! I will say, this year it came faster than ever, but I still can’t wait to unplug and spend these next few days with family. In case you’re doing some online shopping today, I’m sharing one of my favorite winter trends with you: winter whites. But also wanted to do a short post on what Christmas really means to me. Over the past month or two, I’ve shared lots of gift guides, holiday dresses, and Christmas desserts with you – all of which are wonderful things! But, I feel like I would be doing you a disservice if I shared all of those “Christmas-y” things with you, but failed to ever talk about the reason behind all of this. All of the celebrating, the parties, the gift wrap, and the shopping. This season is all for our Savior, who came as a baby thousands of years ago, so that we might one day have a relationship with Him by faith, through grace. Love came down and rescued each one of us! I pray you all abound in that truth today and are filled with joy this Christmas. Love and peace to you all! 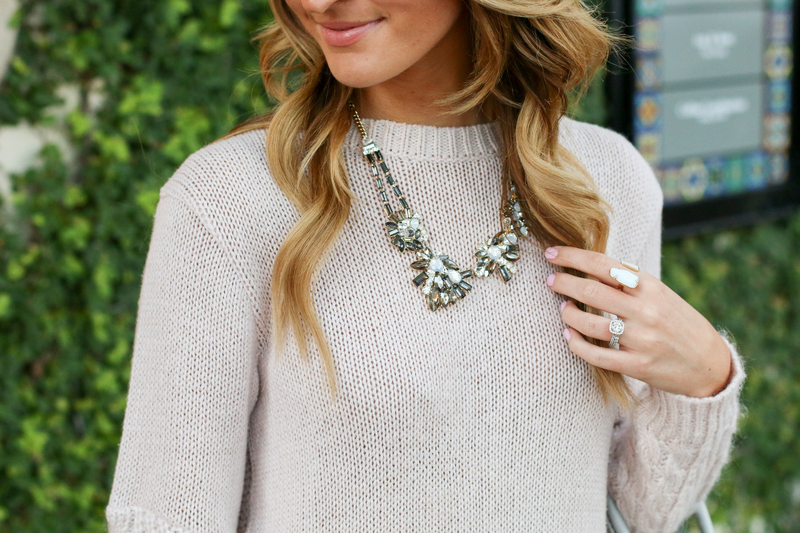 I love the color combination of the blush sweater with the white jeans. You make such a simple outfit look so elegant! So sweet of you to share your beliefs as well. You are right when you say Jesus is the true reason for Christmas! Thank you so much! I’m loving wearing white in the winter right now. Hope you had a merry Christmas!